Normally I would have just installed MongoDB on my local machine, and be done with it. But as always looking for ways to improve, I wanted to run MongoDB on linux. Due to this knowledge base article: https://kb.sitecore.net/articles/920798 I am going to be using MongoDB 2.6. as I will be using a fresh copy of Sitecore 8.0 for final testing. I wanted to run all the command manually to make sure I get everything correct. And if not, then its easy enough to destroy the box and start again. 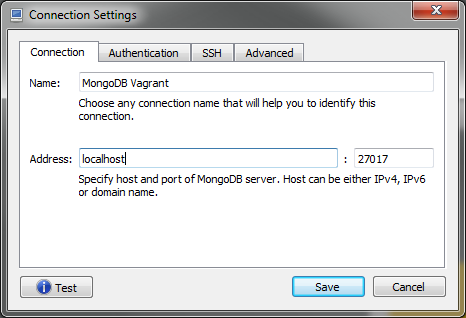 Specify that want to install 2.6.x of MongoDB. On my machine this took approximately 15 minutes to download and install. 0 upgraded, 5 newly installed, 0 to remove and 192 not upgraded. After this operation, 292 MB of additional disk space will be used. 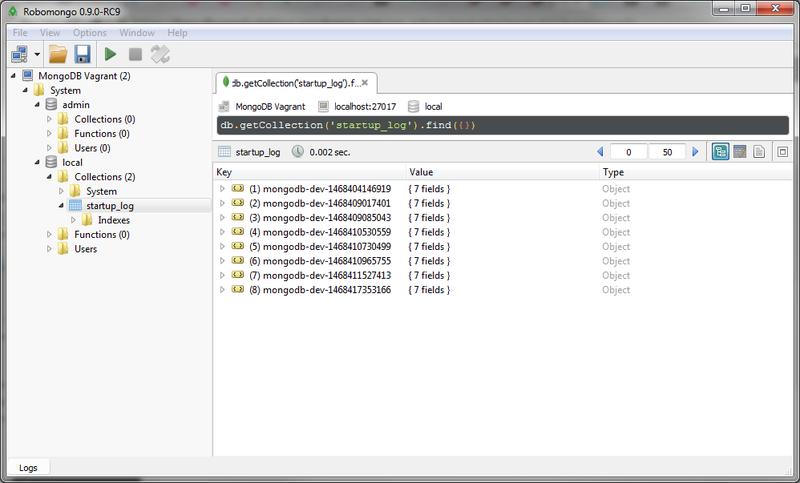 Excellent now we have a running copy of mongo. and exit to terminate the SSH session. By default, MongoDB is configured to only accept connections from 127.0.0.1. This needs to be updated, otherwise MongoDB will not accept connections from the host. The next step is to get Vagrant to port forward all request to port 27017.
config.vm.network "forwarded_port", guest: 27017, host: 27017, id: "mongodb"
this will ensure that all requests to port 27017 are sent to the VM. To test from the host, i have used Robomongo. 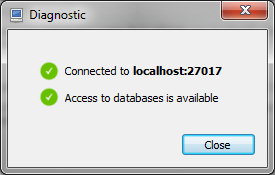 Once the application has installed, run Robomongo and create a new connection. Just give the connection a name, leave the address and port to the default values “localhost” and “27017” respectively. Click on the test button, and you should be successful. I don’t want to have to repeat the above steps every time I want to build a machine, so its time to put all of the commands into a provisioning file, and have vagrant run the scripts when the box is created. I dont want to have to modify /etc/mongod.conf, so copy this to the vagrant folder. The vagrant folder is created by default. This will copy the modified configuration file to the host. 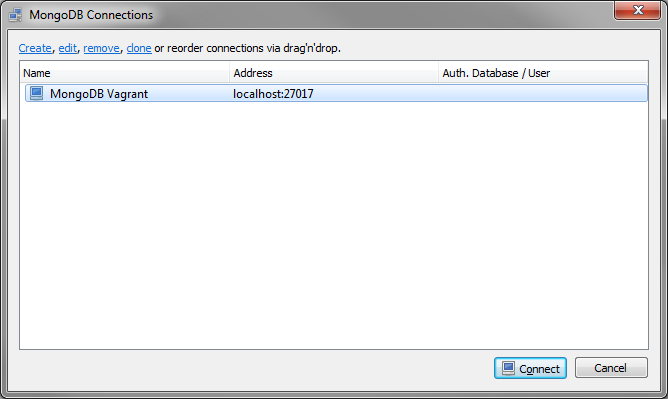 This will become clearer when you look at the provisioning file to be created. It is this line, “config.vm.provision “shell”, path: “provision.sh”” that tells vagrant to run the provision file. You can include the scripts inline, but once you start getting a lot of commands, I find the file get unwieldy. Its all the commands I ran individually. You will notice that I have not included the sudo command, as the provisioning file always runs as elevated you don’t need to use sudo. This command, “cp /vagrant/mongod.conf /etc” will ensure that mongo will use our altered configuration so that we can reconnect again from the host. and it will run through all the commands that where performed previously. It will still take about 15 minutes. The only difference I noted is that when you run the commands, especially “apt-get update” you will no longer be presented with a percentage complete progress dialog. So just wait, it has not hung. After I was satisfied with all of this I then installed a brand new copy of Sitecore 8. I didn’t even need to change the connection settings, everything worked first time. Whenever I start a new Sitecore project that requires MongoDB, with two files I have spin up a new instance specifically for that project. I want to look into where MongoDB is installed, as I have seen a recommendation that you do not install MongoDB into the default folder, but rather into a folder that is version specific. This way when you upgrade, and there is a problem, its easier to just switch back to the previous version. Instead of having only a single instance, I want to set up a standard 3 server configuration of Primary, Secondary, and Arbitar, so that I can have a development environment that is similar to production.